Here are listed some Anime (Japanese animation), graphic fiction (comics, comix, manga, and graphic novels), paintings, drawings, and other artwork that make references to Go. Hikaru no Go, anime and manga created by Yumi Hotta & Takeshi Obata and supervised by Umezawa Yukari. "Chess Player 2 (Go Player 2)" 围棋少年第二部 Chinese anime/cartoon. Here's a fan video on youtube. https://www.youtube.com/watch?v=ltyQj6Nir70 Possibly part 2 series for "Go junior"? Heads I Win, Tails You Lose by Sam Glanzman (comic book story). Glimpse of a go board in one episode of Pokémon (Pocket Monsters). Two people are playing go in the Samurai X (Rurouni Kenshin) OAV when someone busts in to inform them that the Shinsengumi are on a tear. There are also several 18th and 19th century UkiyoE prints that refer to Go. A goban appears in the corner of a Harold Hedd panel. Usagi Yojimbo by Stan Sakai: Demon Mask features a story with Go as a fairly central theme. The whole series offers and interesting and alternative view of medieval Japan. Go was seen twice in Peace Maker Kurogane episode 4. Once with Kondou Isamu and Yoshida Toshimaru, then again later in the episode with two unknown characters. Cyborg 009 by Shotaro Ishinomori (石ノ森章太郎 Ishinomori Shōtarō). Ranma 1/2 manga by Rumiko Takahashi: Ranma Saotome (早乙女 乱馬 Saotome Ranma) had to battle the twins with a huge go board. Was this in the manga or the movie or both? GaoGaiGar Final: Several scenes with a goban and some playing. Otogizōshi: A scene where Hikaru is flipping the channel due to static and one channel shows some stones and a board. The Twelve Kingdoms (Jūni Kokki): In episode 20 Sugimoto talks to Taiki in the library, and the flash up a guy reading a book with a go board on the cover (similar to the elementry series). In an episode of the popular anime Code Geass: Lelouch of the Rebellion there are two soldiers of the Japanese Liberation Front shown playing go in the JLF's secret hideout at Narita. Lelouch, disguised as Zero, enters said hideout and geasses them into ignoring him. While Lelouch creates battle plans for his Black Knights, the soldiers continue their game (being a chess person, Lelouch does not pay any attention to them). Japanese scroll painting about a Japanese minister travelling to China about 770. The scroll paintings are not as old, maybe Heian time. 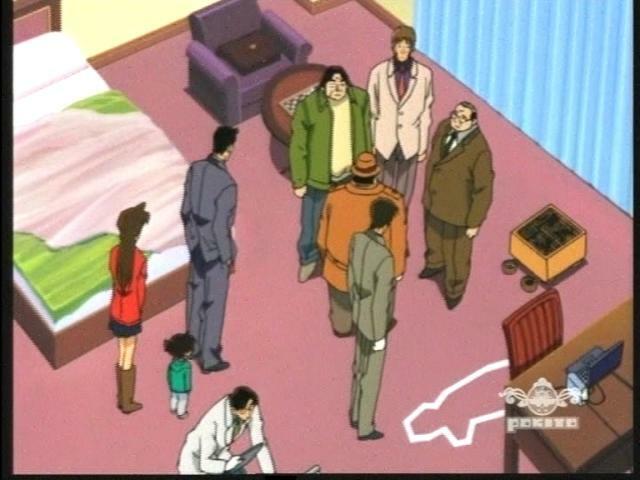 Detective Conan A goban acts as a key-factor to the solution in a mysterious murder-case. One of the anime Naruto major characters (Shikamaru) is an avid go and shogi player. During the opening of Naruto Shippuuden EP33, a goban can be seen. Phelan: I just watched the scene, and I'm not sure if it's a goban. It does look like a floor goban, but he has shogi pieces on top of it, so it's probably a shogi floor board. 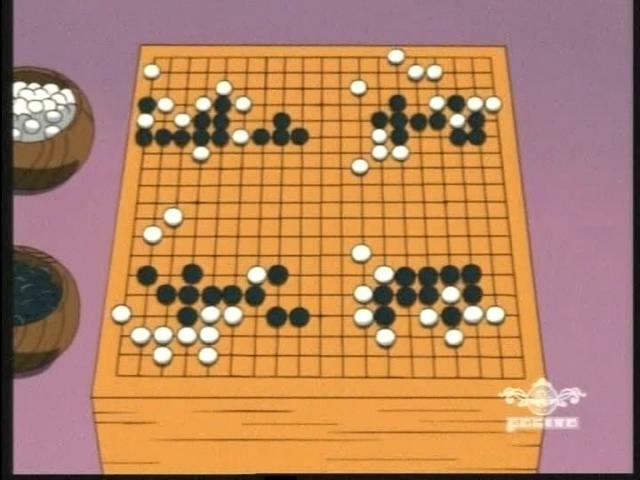 Naruto also features mention of Go in EP64 and EP70 in reference to Shikamaru's mastery of strategy. Chapter 32, page 12 of Kekkaishi shows the grandfather walking in holding a board with two bowls. On the first episode of K-On, Go is seen twice, first as a poster for a Go club, then being played half way through the episode. Nichijou they have a combination of Go and Football which really is just juggling and balancing a football, Goban and other stuff. Shonan junai gumi (young gto) ep.2, 29th minute,Kamata a rival delinquent puts black stones in the mouth of Danma Ryuji and punches him in the face.